Last month I boarded a big bus full of hungry dietitians and took off from Nashville to the Hatcher Family Farm in College Grove, Tennessee. We suited up with big plastic booties to cover our boots and got ready to get dirty! The early wake-up was totally worth it as I got to meet, greet and eat with some of the best dietitians in the country while celebrating the National Dairy Council’s 100 year anniversary in style! We were welcomed to long tables with a beautiful array of cheeses, fruits and the best zucchini muffin I’ve tasted with an authentic banjo band playing ‘Wagon Wheel’ as we filled our bellies with healthy, wholesome food! These days, everyone has become a foodie, with photos of the healthy (and not so healthy) foods we eat rampant on Instagram, though somehow, we seem to have lost our connection to the foods we eat. Even dietitians, who have been trained in the best nutritional science and evidence-based practices, are often missing the connection to the food we recommend. All of my expectations of what a farm would be like were exceeded by this modern family dairy farm. The whole family lived on the farm and everyone was so passionate about doing their part for the greater good. They worked so symbiotically, milking the cows, packing milk onto the trucks and providing quality local milk to the area. One of the Hatchers was the veterinarian for the whole farm, and she spoke about her pregnant cows the way my obstetrician talks about the babies she has delivered. Every cow and calf had names and unique personalities and was treated as part of the family. They even had a ‘Cow Hall of Fame’ to remember their favorites. 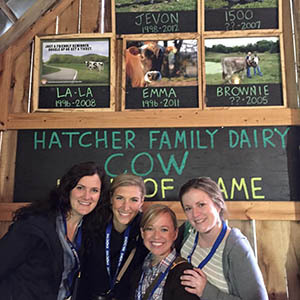 The younger Hatchers give the place a hip vibe and they had all sorts of fun props for us to take pictures and connect on social media like their #SayMoo picture frame and their hall of fame. The circle of life was present in both the hard working family, and the baby calves and their parents. My favorite quote from the youngest Hatcher has stuck with me: “Hose yourself off and keep going.” I will! 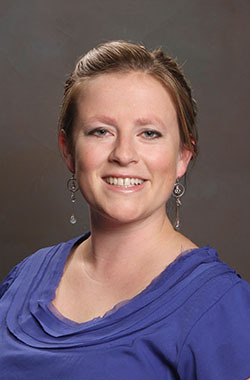 Nina Crowley, PhD, RDN, LD is a bariatric surgery dietitian at the Medical University of South Carolina in Charleston and nutrition advocate serving the South Carolina Academy of Nutrition and Dietetics as its Public Policy Coordinator.